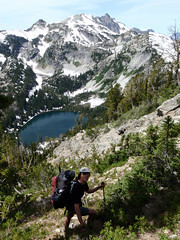 Captured here is an action shot of me traversing and descending a steep slope above Rainbow Lake. Hitomi talks about her travails on her blog (in Japanese) and it's all true: The hike was long and tiring. We did indeed have time to lounge around camp, time to swim and nap, so it wasn't nonstop hiking. Although there are many summer weekends already scheduled with some choice activities,there are plenty weekends left I hope to spend with Hitomi hiking or kayaking. Last night, Kevin brought up that there are now direct flights to Iceland from Seattle for around $650. Maybe Hitomi and I could go bicycling there? Sounds like their economy has tanked, which always is good when you're a tourist.